Isis Dates: March 11 – 31, October 18 – 29, December 19 – 31. Traits of Isis people: Active, Straightforward, Dignified. Lucky Colors: White for men, Blue for women. Associated Zodiac Sign: Pisces ♓. The Supreme Goddess of Egypt, the symbol of motherhood and femininity. 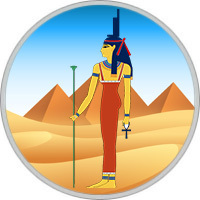 Isis is the wife of Osiris, protects newborns and seafarers. According to legend, she managed to revive her husband, killed by a jealous brother Seth. She is portrayed as a woman with bull horns, between which shines a solar disk. On her lap she sits a son — the god Horus, the messenger of the gods, the avenger. Women born under this sign are particularly fortunate. The main essence of Isis is love. These people give warmth and tenderness to others. But we should not consider them weak-willed, they know exactly what they want in life. The best professions for them are teachers and economists. It is believed that the children of Isis are the favorites of fate, the lucky ones. Any adversity is avoided by them. They are open, cheerful, but somewhat ambitious. Live, enjoying the fullness of life, beautifully and vigorously. They do not recognize the prohibitions, they do not know remorse, pleasure and pleasure is their vocation. They adore exciting experiments. With them you do not get bored. The people of Isis are calm and benevolent, somewhat trustful and certainly generous. In their youth they are amorous, but, having found their love, keep faithfulness to it for the rest of their life. Often idealize their partners, and, of course, disappointed. After many mistakes they sometimes stop searching and prefer to live alone. And they shed all their unspent emotions at work, reaching unprecedented career heights. Men of this sign are ambitious and open personalities who are friendly. They live in pleasure, and do not feel remorse at the same time. The opinion of others is not of interest to the Isis man, he will still do everything his own way. To relatives and friends helps financially, the generosity of this person knows no bounds. Because of his amorousness, he can not build strong relationships with women and often suffers from unrequited love. Isis is always ready to meet the people who ask her for help. A sociable person thanks to her natural charm is able to solve any problem. A long time looking for the same man with whom you can build a serious relationship. A real idealist often turns out to be disappointed, people do not justify her trust. Ideal does not happen and if you do not make the right choice in time, you can remain alone forever. The sincere and kind Isis woman in the relationship behaves selflessly, she is ready to do everything possible to win the trust of her chosen one as soon as possible.